'Goed van den Bogaerde" is a historic, nearly completely original farm which has been transformed into a beautiful holiday home with a rich tradition datingback many centuries (until the 16th century). This holiday farm has a beautiful façade with charming shutters. The interior contains many old elements such as the cellar with barrel vaulted ceiling, high wooden beamed ceilings and an imposing chimney. Out on the front gable above the door, there is a memorial stone in honour of the golden anniversary of the van den Boogaerde couple in the year 1799. The residence has been lovingly furnished in detail to provide even more charm. The large garden is equipped with a beautiful terrace for long summer evenings. The children can play to their hearts content while you prepare the BBQ and enjoy a lovely drink. The lower level is also accessible for disabled persons (4). 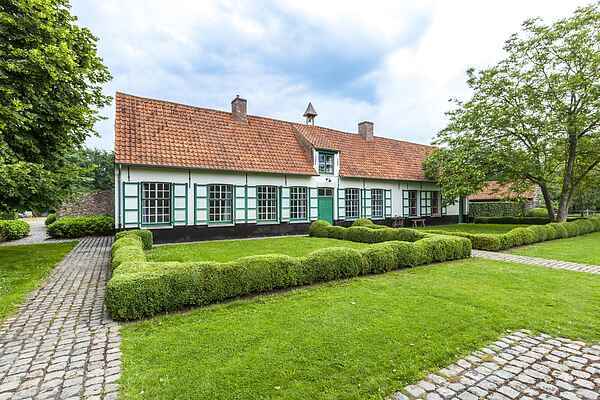 In walking distance you have the provincial domain of Bulskampveld (220 hectares) including a castle, botanical garden, fish pond, playground and restaurant. Bruges is only a few kilometres away. Bruges earned its nickname, the Venice of the north due to its many old canals, bridges and beautiful buildings which bear witness to its rich past. The near vicinity to the Oostende-Brussels motorway assures that the coast and famous cities (Ghent, Brussels) can be reached within 30 to 60 minutes. When you saty in the Goed van den Bogaerde, you will enjoy the hospitality of Flanders, with many beautiful hidden corners.